Coach Roy ("R.D.") 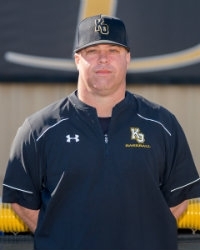 Harwell is the Varsity Assistant for the Klein Oak Baseball program. He has been at Klein Oak for 12 years. Coach Harwell was the JV coach for his first 5 years here, and now is in his 7th year as the Assistant Head Coach. He also is the Boy’s Cross Country Assistant Coach. Coach Harwell attended Montgomery High School and Conroe High School. He was a four-year varsity baseball letterman. R.D. also played four years of college baseball at Richland College and then Abilene Christian University. During that time, he was a part of four conference championships and went to the National Junior College World Series twice. He started at pitcher and in the outfield. He graduated from Abilene Christian in 2003. Coach Harwell taught at Travis Intermediate school for two years before joining us at Klein Oak. R.D. has been married to his wife Karen for 7 years. They have a two-year-old daughter named Callie, and they reside in Montgomery. His parents are Roy and Barby Harwell. Coach Harwell’s mother works in Montgomery ISD as a PE teacher for the last 29 years. R.D. has two sisters, Holly and Jennifer.